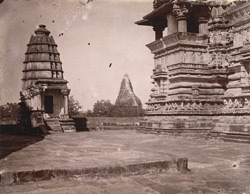 Photograph of a close view of walls, looking towards small corner temple, on the terrace of the Chaturbhuja Temple, Khajuraho, Madhya Pradesh from the Archaeological Survey of India Collections, taken by Joseph David Beglar in 1871-72. The The Chaturbhuja Temple from the 12th century is a fine temple of the Chandella style. The sanctuary and the porch are raised on a terrace and the slender spire has clusters of smaller towers rising towards the amalaka and pot finial. Small shrines are situated at the corners of the terrace.